We give complete mobility solutions for beauty salons, hair salons, spa centers & beauty product stores for handling their daily business operations to gain an edge in the extremely digitalized market. Provide your customers with an online appointment and scheduling solution & allow salon managers to connect with their customers for the offers & services. 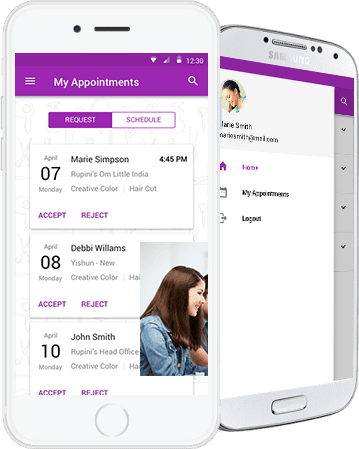 The Mobile App Maker creates the most cutting-edge mobile app development solutions for the beauty salon industry to empower personal care employees and companies. The solutions offer features such as online appointments, catalogs, offers, ratings/reviews and such. Beauty salon and such niche industries target a healthier lifestyle among citizens and corporates. Connect with your clients on social media and share content, offers and other services right from your mobile phone. Integrate your app with any third-party software solution like accounting, supply chain etc. Our trained business analysts and mobile app developers have the technical know-how to understand and serve all personal care companies with cutting-edge app solutions that cater to your exact needs and provide apt solutions to your target audience.